GWH upgrading includes two package; stormwater package and Water & Sewer package. Construct and install around 10km of stormwater pipes and around 500 number of drainage pits & HW. Construct RCBC, CDS unit, ACO drain, open channel drain and so on. Removal of existing drainage pits and pipes as required. Connection to existing as required. Supply, construct and install around 4km of watermain and fittings. 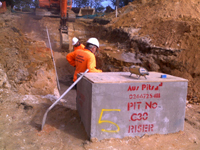 Supply, construct and install sewermain and sewer rising main. VAPS Early Works contract includes two package; Stormwater Package & Hydraulic Package. 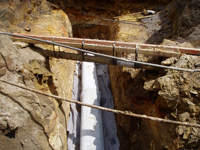 Supply and lay new stormwater pipes, pits and fittings. Removal of existing pipes and pitsw. Supply and install temporary diversion. Supply and lay temporary watermain including connections to existing. Supply lay, and commission high pressure, low pressure and potable cold water supply and fittings. Disconnection and re-connection of of all services off the existing water mains onto temporary. Supply lay and commisision all news sewer pipes and rising mains. 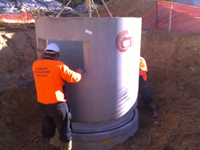 Supply lay and commission all new stormwater rising mains including pits, fittings and fixtures.